While Austin doesn't share my enthusiasm for real, brewed tea, he does love himself a good chai. It turns out my mom found the best do-it-yerself chai mix at her favorite coffee shop in Smallsville, WI. 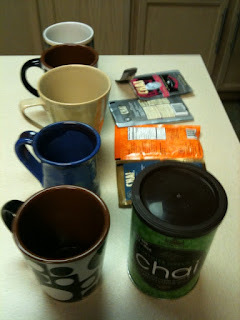 Part of Austin's birthday present was a sampler of a number of David Rio chai mixes and he was thrilled to do a side by side taste test. Austin's winner was the Tiger Chai for its exotic spiciness and I liked the Tortoise Green Tea Chai for its mellow-sweet qualities. Austin was just so pleased he could try a number of flavors and select his favorite to "order as much as I can until it is discontinued." The chai test was quickly over, however, as we turned our attentions to making chili, chili-cheese dip, deviled eggs, and cheese cake for the big game. More on that later.